For all your soldering needs! 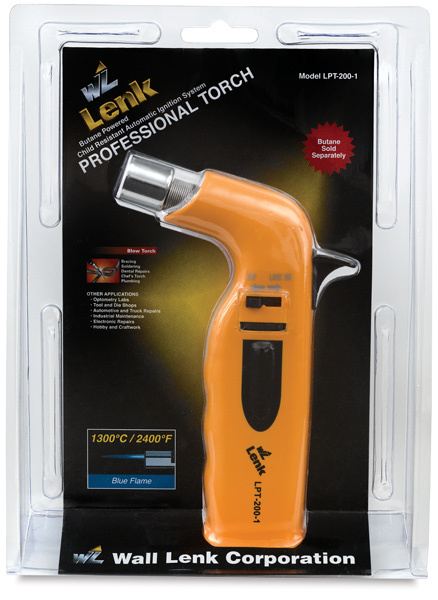 Wall Lenk Butane Fuel — An economical, quality butane fuel for refillable butane torches and lighters. 1.5 oz (44 ml) bottle must ship ground. LPT-200 and 500 Pro-Torch Auto-Ignite Torches — These torches provide adjustable, high output flames. They have sturdy yet lightweight polymer bodies and ergonomic grips that make these refillable torches ideal for lab, studio or home. Internal parts are longwearing brass and ceramic. On minimum settings the pro-quality LPT-500 delivers 200 minutes of non-stop use; the LPT-200 delivers 60 minutes. 2500°F flame temperatures. Some assembly required. ™ Wall Lenk is a trademark.™ Micro-Jet is a trademark.